At the Center for Facial Plastic Surgery, Orange County facial plastic surgeon Dr. Ali Sepehr is reaching out to patients experiencing hair loss from chemotherapy with the Lashes of Love Program. The program offers qualifying patients the effective topical eyelash growth and lengthening product Latisse® for free. Dr. Sepehr says he hopes to provide a boost to the confidence and self-esteem of these patients, and help restore the sense of femininity often associated with long eyelashes. Dr. Ali Sepehr is a board-certified facial plastic surgeon. 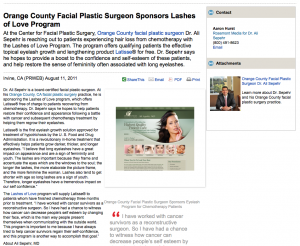 At his Orange County, CA facial plastic surgery practice, he is sponsoring the Lashes of Love program, which offers Latisse® free of charge to patients recovering from chemotherapy. Dr. Sepehr says he hopes to help patients restore their confidence and appearance following a battle with cancer and subsequent chemotherapy treatment by helping them regrow their eyelashes. Dr. Ali Sepehr earned his medical degree from the University of California, Los Angeles School of Medicine. He then completed his facial plastic and reconstructive surgery residency at the University of California, Irvine, as well as a fellowship at the University of Toronto, Facial Plastic and Reconstructive Surgery. Dr. Sepehr is a Diplomate of the National Board of Medical Examiners and a member of the Alpha Omega Alpha Society. The Center for Facial Plastic Surgery is located at 16300 Sand Canyon Ave. Ste. 201 in Irvine, CA 92603 and can be reached at (949) 371-6963, or found online at orangecountyfacialplasticsurgery.com or facebook.com/pages/Ali-Sepehr-MD/184709664904374.